Preheat oven to 350 degrees F (175 degrees C). Grease and flour Bundt or tube pan. In a medium bowl, mix together flour, soda, salt, allspice, cinnamon and nutmeg. Set aside. In a large bowl, combine oil, eggs and 1 1/2 cup sugar. Beat 2 minutes at medium speed. Add flour mixture, alternating with 1 cup buttermilk, starting and ending with dry ingredients. beat well after each addition. Stir in prunes, pecans and 1 1/4 teaspoon vanilla. Pour into greased and floured bundt or tube pan and bake at 350 degrees F (175 degrees C) for 1 hour or until a toothpick comes out clean when inserted in the center. Make large, deep holes in hot cake and pour topping in holes and on top of cake a little at a time, giving it time to soak in. For the topping: In saucepan, over medium heat, cook butter, 3/4 cup buttermilk, corn syrup and 1 1/2 cup sugar until sugar and butter melt. Remove from heat and add 2 teaspoons vanilla and stir. 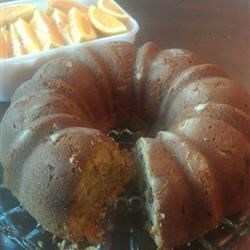 Excellent cake, very moist, I also did not use the glaze as it was sweet enough. Reduced the amount of sugar to 1-1/4 cup. Used chopped walnuts instead of pecans. Will definetely make it again. I was so glad to find this recipe. Except for the name "Prune Cake" prune haters would never know. Call it "Spice Cake" and no one will suspect.